The majestic building in white marble extends over 157 m length. With its five ships the cathedral is overwhelming. The light falls through beautifully decorated stained glass windows in the interior. 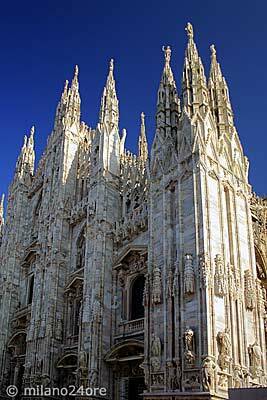 The Duomo, the Cathedral of Santa Maria Nascente, is the most important example of Gothic architecture in Italy. 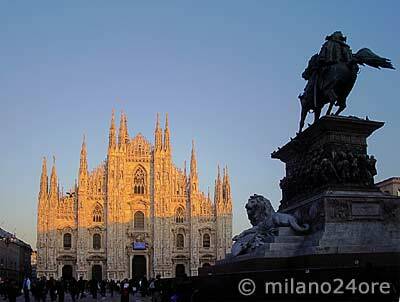 In 1386 started the works of the cathedral under the reign of Gian Galeazzo Visconti. 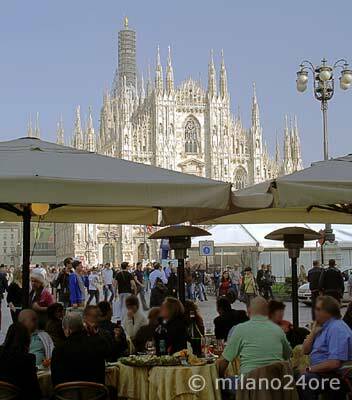 During the construction period of five centuries, numerous architects worked at the Duomo. In 1567, work began on the facade in classical baroque style. During the long construction period, a variety of styles and shapes have been incorporated into the construction. In 1805 the work on the façade was completed. The construction of the towers on the roof continued until the 19th Century. The cathedral roof, constructed from Candoglia marble from Lago Maggiore, too, presented a unique innovation in the construction of cathedrals. On 8000 m² roof surface you can admire the 135 soaring spiers of the cathedral. Then you are surrounded by over 4000 marble figures Guglie, the peakes of figures and ornaments, of which each is a unique piece. the first skyscraper in Milan, Torre Velasca behind the Royal Palace Palazzo Reale. On a clear day you can see the entire northern Alps, starting with the Monte Rosa massif in the west, through the Swiss Alps, the foothills above Como and Bergamo to the Bernina top. To the south the view extends to about 300 km distant Monte Viso on the French border in the southwest and the chain of the Apennines from Genoa. A total of 3,400 statues perched on the tops of the cathedral. 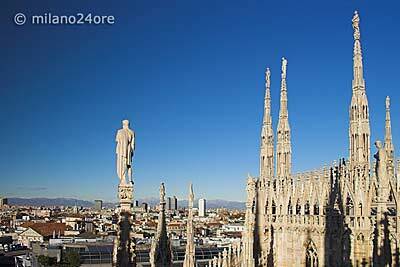 The highest point of the dome occupies the Madonnina, the 4.16m large golden statue at 108.50 m Height shines afar in the sun. 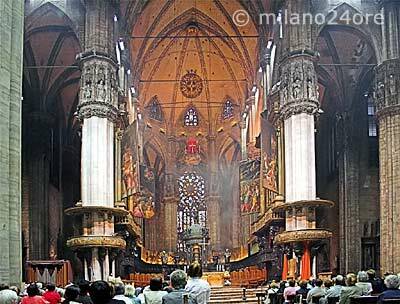 Milan Cathedral is a sacred place in which it people pray and confess, and where regular holy Masses are celebrated. In the cathedral is to preserve silence and cell phones are off. Entry is only allowed in appropriate clothing. Tourists in shorts and strapless shirts will be denied admission. In case of religious ceremonies or special events may cause the closure of the cathedral. Admission is free for individual visitors and worshipers. The central nave of the cathedral is wheelchair accessible. Students and groups of pilgrims € 2.00 p.P. The ascent to the cathedral roof is available in every season. The ascent is by foot or by lift. in the elevator: 12,00 € p.P. Groups over 15 persons on foot: 3,50 € p.P. For the elevator to the cathedral roof, the Baptistery, the Cathedral Treasure as well as concerts in the cathedral you will receive a 10% discount on presentation of MilanoCard when purchasing the tickets. With the previously acquired tickets to avoid queues.